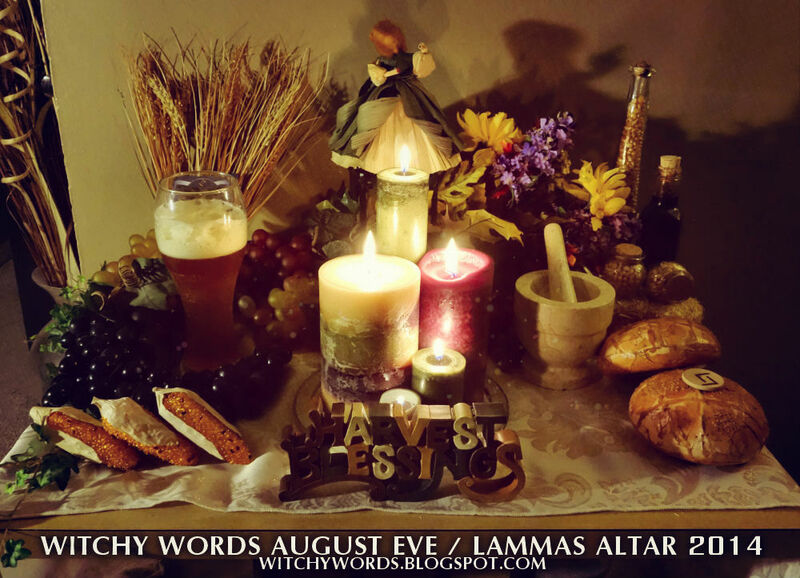 To see last year's August Eve / Lammas / Lughnasadh altar, click here! August Eve is the first harvest sabbat of the year! It falls between Midsummer and the Autumn Equinox, making it an equilibrium of summer and fall. The colors I use to decorate my altar for this sabbat reflects both of those attributes. 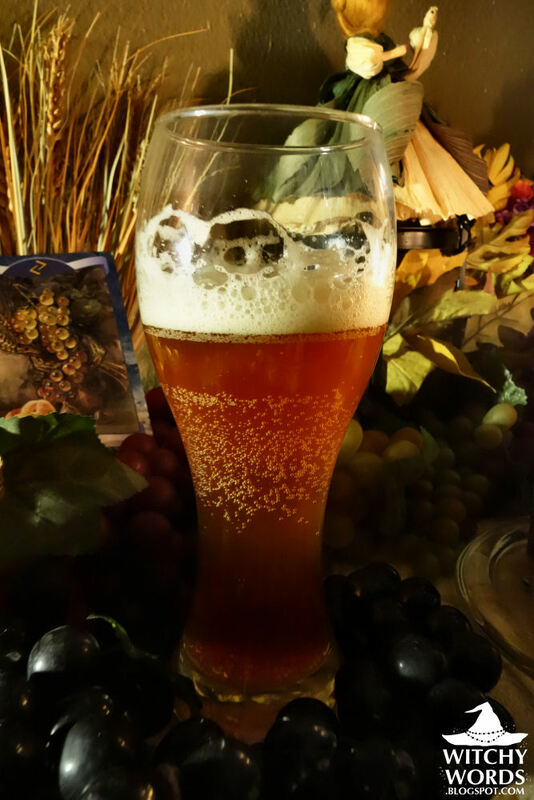 Golds represent both the grain harvests of wheat and corn and their creative derivatives, such as breads and ales. Gold also represents the hot sun we typically experience for Kansas City Augusts. Green is symbolic of the fertility of the earth as well as the green still seen in the trees and lawns. I also like to add a red-violet to the mix. I typically see violet as a fall or winter color, but its warmer tones remind me of late summer. Red-violet also happens to be the color of apples, grapes and wines! I've also included appropriate flowers, local honey and jars of corn kernels. The jars can even be representative as we often begin jarring and canning food for the winter at this point. 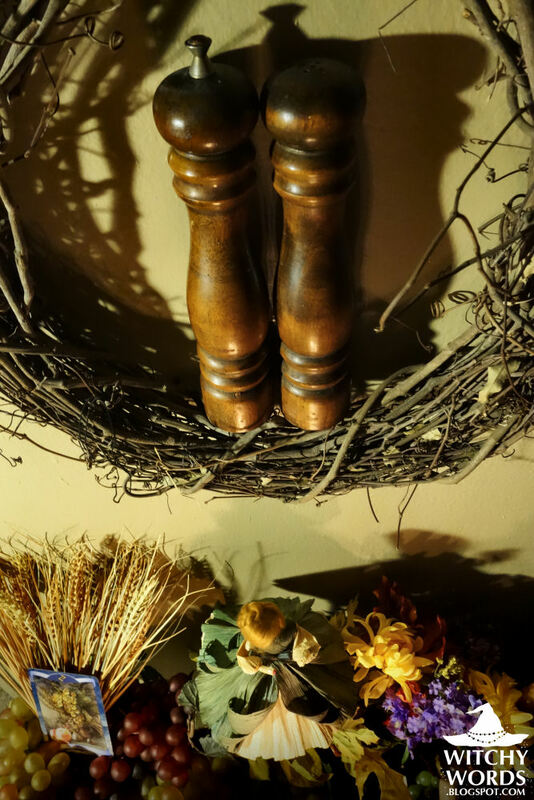 In the center of my altar on a pedestal is a corn doll. 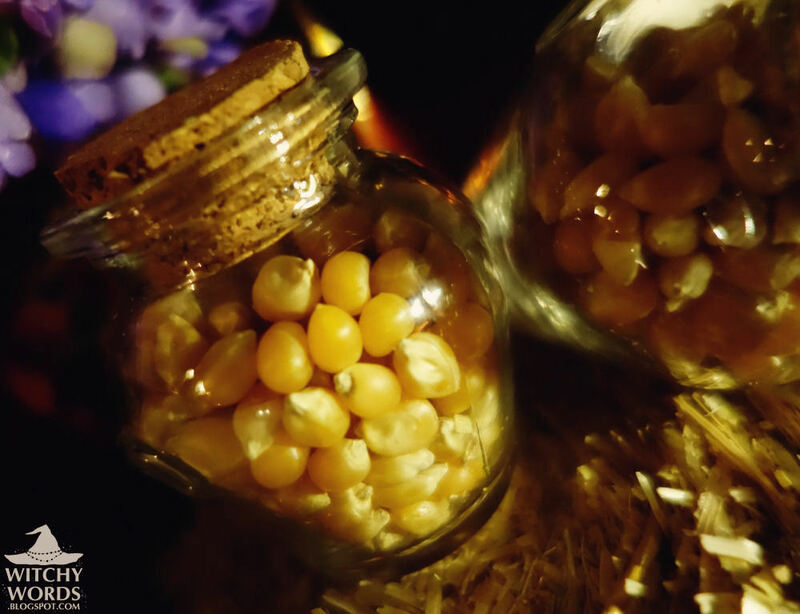 Corn dolls are customarily made on August Eve as it is a grain sabbat. 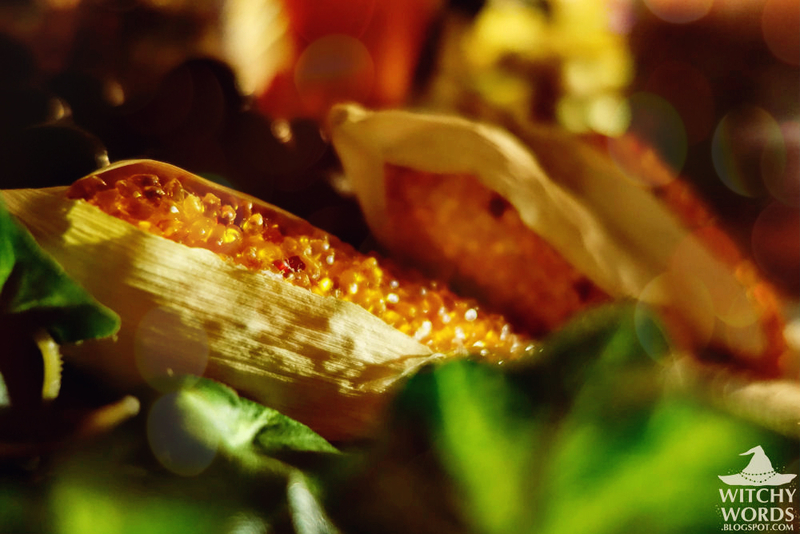 It is believed that the spirit of the corn found itself homeless after the last harvest. 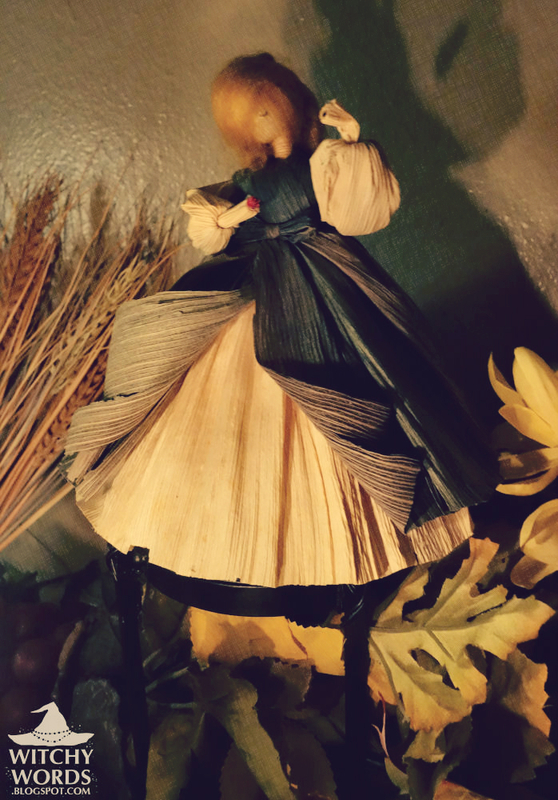 Corn dolls served as a means of giving that spirit a home until the next crop was planted. ... as well as my wooden salt and pepper mills passed down to me from my grandmother. These are sitting in the wreath just above the altar. I'm sure you've also noticed the Elder Futhark rune Jera in several of the pictures. 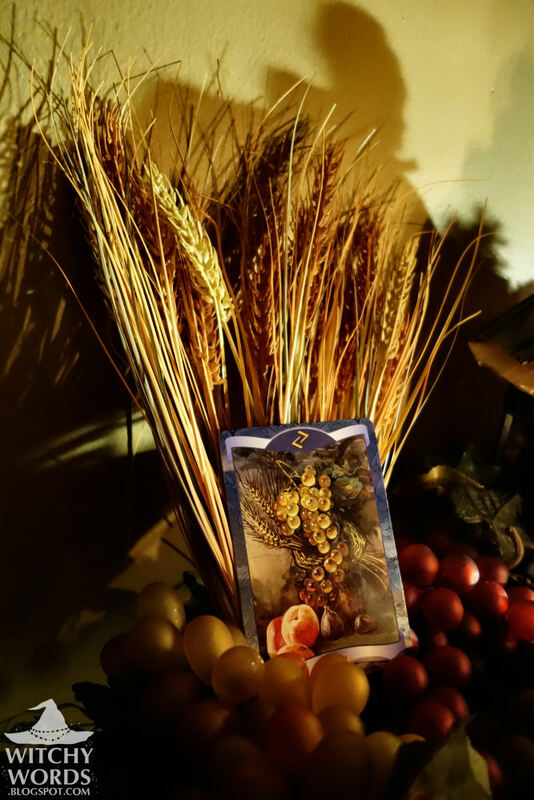 Jera is the harvest rune, representative of cycles and years. In the picture above, you can see a Jera card from the Lo Scarabeo Rune Oracle Cards. I've also included a rune tile from a set that was burned by the amazing Urban Crone. You can see that one on the top of the bread in a previous picture. 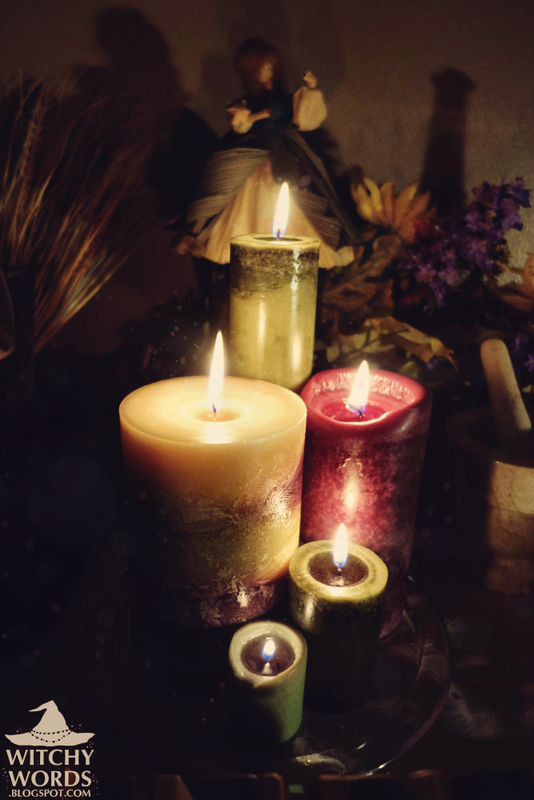 In the center of the altar, I have five candles that reflect the appropriate colors for August Eve. They are arranged in a staircase spiral to reflect the cycle of the seasons. I was very happy with last year's altar for this sabbat, so I kept many design choices from that. I then added to it from items I've procured over the course of the year. 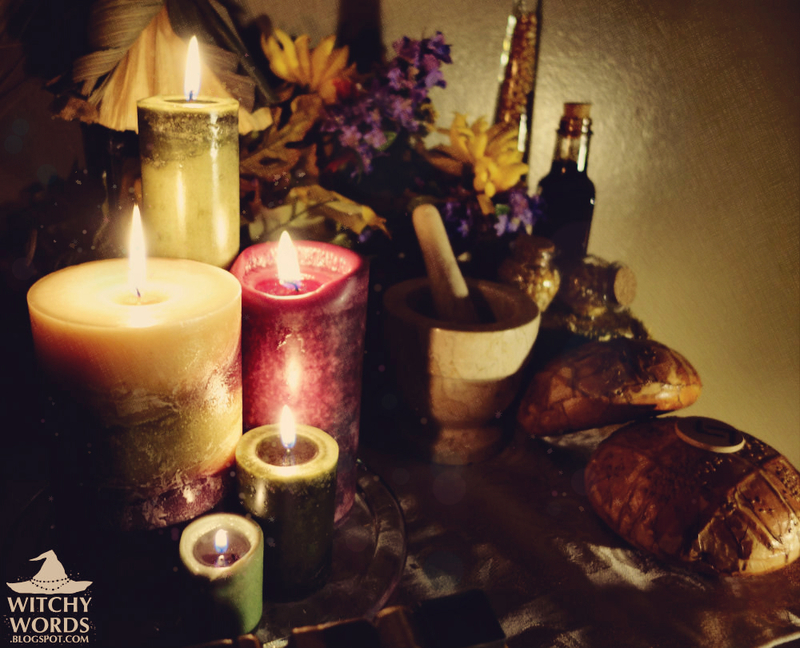 As always, an altar should not just reflect the sabbat you're celebrating but it should also be representative of who you are as a pagan, Wiccan or witch! I hope you've enjoyed the pictures of my altar! I'll leave you with a full visual explanation. Enjoy! 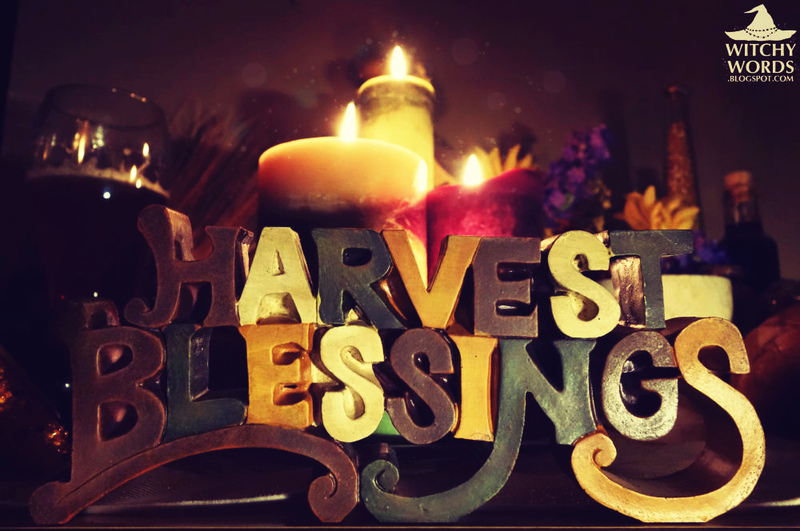 Have a wonderful first harvest and August Eve! Coming soon: Circle of Northern Fountain's August Eve celebration. Beautiful altar! Love your runes. I am about to make my own out of some stones I collected on my Great Lakes vacation. I finally picked up a gold sharpie today. =P What are yours made out of? Thank you so much! And good luck with your runes! The runes above were made by Urban Crone. I picked them up from our local metaphysical shop, Mystic Treasures, but she's stated before that she makes them from those little tiles you can get at craft stores. 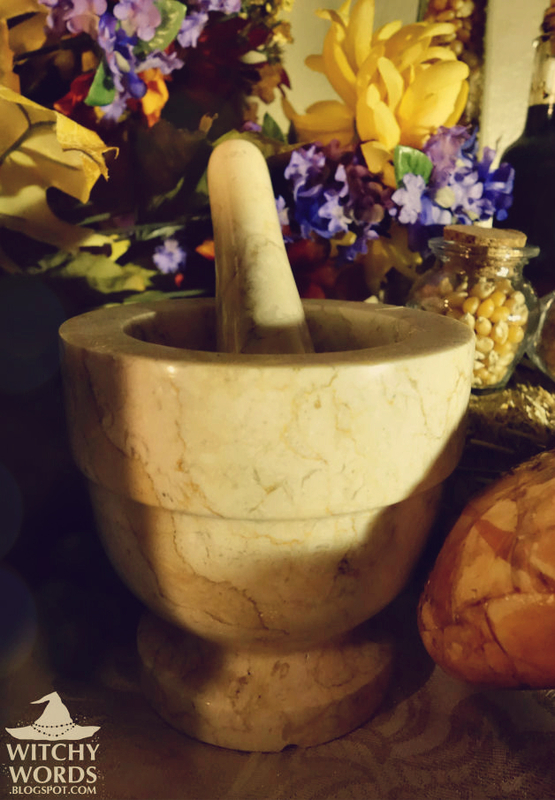 I actually have my own set that I've made out of witch hazel, but I keep that one entirely for divination and use Urban Crone's set for display! I try to switch out my altar about midway between each holiday. It usually takes a few days to get an altar fully set up; inevitably, I always find something I really want to add but don't have. 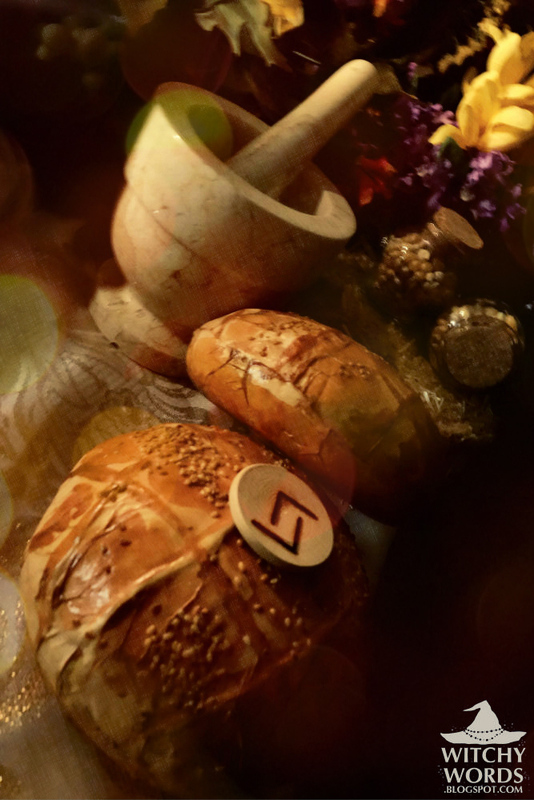 For this altar, I felt I needed bread, corn ears and a plate under the candles as I didn't have one big enough. Then I usually leave the altar for a week to make sure my cats won't mess with it before photographing it. If I have to rearrange my altar to suit my cats after I make the blog posts, I don't feel like I'm being as honest as I could be about what my altar looks like. Though I do admit the corn doll goes into storage every night. I don't trust them with it, lol. Also, thank you so much for tracking that post down! I really appreciate it. For the better part, as long as the image still has my website stamp on it, I don't mind too much. It's the posts that intentionally crop my website stamp on the image out - or, even worse, crop it out and add their own - that bothers me. Nonetheless, I really, truly do appreciate it! You're so wonderful! Thank you so much!